Recently, the Wall Street Journal reported on a possible dictatorial leader, a coup, and a secession. And these things took place in our nation's capital. I haven't heard about this reported elsewhere. This doesn't mean there was a cover-up, but I do think these events warrant more attention. For years, Republicans and Democrats in Washington have often compromised to get things accomplished. They "played ball" with each other, being aware of the realities of the system of give and take. Now, however, a group of Republicans is no longer willing to play ball with a group of Democrats. And I'm talking about softball. For 37 years, hundreds of young Congressional aides have put their partisan feelings aside and participated in the Congressional Softball League. But during the off-season, some Republicans objected to the way the playoff system has been run. They felt that the commissioner, Democrat Gary Caruso, was "running a socialist year-end playoff system." Socialism in softball? Was there a collective farm in the outfield? Instead of the typical playoff system that rewards teams that played well during the regular season, Caruso's system gives every team a good chance to win. So, those who oppose this playoff system asked the same question that NBA fans ask each year, "Why bother playing the regular season?" Caruso said that the Republican idea of favoring the top teams was part of their plan "to wage class warfare on the more relaxed teams." Right. And umpires are storm troopers? Do you get the feeling that both sides take this softball league a little too seriously? What's next, are conservatives going to refuse to play Left Field? If a Republican steals a base, are the Democrats going to call for an investigation? Instead of coming up with a compromise, some Republican teams picked up their balls and bats and bolted to form a new league. Perhaps some of the Congressional aides on both sides are thinking about running for office someday. But if they can't agree on something like a softball league, how are they ever going to agree on things like taxes, Social Security, and which states get to have the most expensive, unnecessary projects? I have a feeling that both sides could have compromised on a softball playoff format without selling out their basic ideological principles. Athletes of different political persuasions putting politics aside to participate in sports has always seemed admirable. During the Olympics, we often see good sportsmanship between people who would be enemies away from the playing fields. We always hope that people on both sides see that their opponents are "just regular people like them," not monsters as they may have been told by their political leaders. Then after the games, maybe they'll have a little more tolerance for people with different beliefs than theirs. 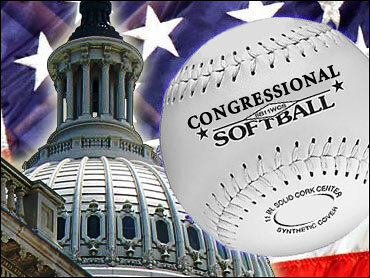 And that was a good thing about the Congressional Softball League. Republicans and Democrats could forget their differences for a few hours and just have fun. Maybe after the games, they'd go out for dinner. I'm sure political issues would come up then. Maybe they'd see there is really more than one side to most things. Maybe the next day, they'd suggest to their bosses that the opposition "wasn't that bad" and could be dealt with. But that's over. And not just in softball. Positions have hardened so much today that people believe their side is definitely right and the other side is completely wrong. There's no in between, there's no desire to listen to people with opposing views. People can't seem to have friendly, rational discussions anymore with those who disagree with them. Are you able to talk about politics with friends who don't agree with you without feeling you have to change the subject to things like "why do red stop lights seem like they're longer than green ones?" It would be nice if President Bush, who once called himself a "uniter," would walk over to the National Mall and tell the feuding softball players to knock it off. And after talking to them, maybe he'd be motivated to talk to the leaders of both parties and tell them to "play ball with each other." He could even suggest that the American people do the same thing. In other words, stop name-calling, stop blind partisanship, and be more tolerant of each other. It's the best way to work things out. And it's as American as a weekly softball game.